Purchased scrapbook papers come in many different colors and patterns, but they can be quite expensive. If you're on a tight budget or simply want to use something unconventional, consider alternative sources of paper to create your layouts. 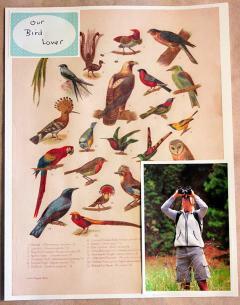 Inspiration for your scrapbook album can be found all around you. As you go about your day, start paying attention to any colorful papers that you encounter. Collect your favorites in a large folder so you'll have a nice selection to work with during your next scrapbooking session. 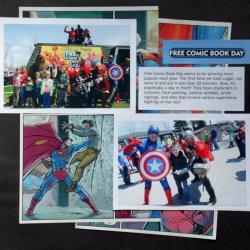 The colorful illustrations on many comic book pages make great accents for your scrapbook layout. Comics can be used to accent pages of your child playing with his favorite superhero action figures or your husband getting ready to attend a comic book convention with his friends. Comics also work well for nostalgic pages with a casual feel, especially if you use pages from a vintage comic book. However, if you're going to use comic book pages for your scrapbook layout, it's a good idea to check with a collector first. Older comic books can sometimes be valuable as collector's items, so you want to be sure you're not ripping apart anything that might be used to help put your child through college. 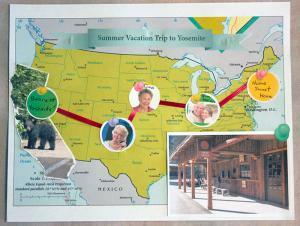 Maps are the perfect backdrop for travel themed scrapbook pages. Use a map of the place you visited as your background and highlight special stops with stickers, brads, or colorful buttons. If your trip involved going to a new state, crop one of your photos in the state shape and use foam adhesive squares to layer it over the appropriate spot on a U.S. map. Is your refrigerator full of your little one's scribbles and finger paintings? If so, consider turning some of these masterpieces into scrapbook paper for your next layout. You can use them as background paper or cut them into photo mats. Another creative way to incorporate your child's artwork is to punch circles or squares from the image and arrange them to make a modern-looking page border. Book pages give a sophisticated feel to any scrapbook layout. If desired, you can use the pages to support the theme of your journaling by highlighting relevant words with chalk or fine tipped markers. Old books with damaged covers, missing pages, or loose bindings can often be found at thrift shops or library book sales. These books are perfect for paper crafting since they are no longer in readable condition. Have you ever received a beautiful card that was just too pretty to throw away? If so, consider turning it into part of your scrapbook. You can cut out elements from the card to use as decorative tags. If you like the design on the front of the card, glue it to your layout and add extra photos over the words on the inside of the card. This technique works well for birthdays, anniversaries, and other occasions that involve receiving greeting cards, since it lets you preserve the card as you create extra space for additional images from the occasion. 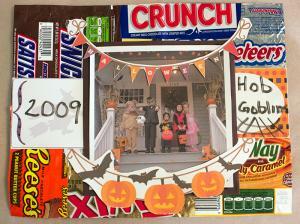 Candy wrappers make fun accents for Halloween scrapbook pages or pages about summer parades. 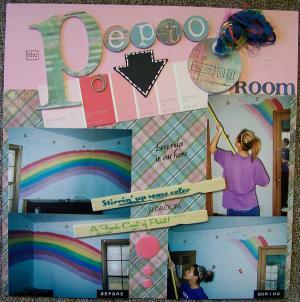 Use Mod Podge to make a background from your favorite wrappers. Do not worry if the wrappers are slightly crumpled, as this will lend an interesting texture to your layout. You can also try making a candy wrapper chain and attaching it to your page with glue dots to create a colorful border. If you're working on a layout about a home remodeling project, use the paint chips you picked up at the hardware store to make colorful mats for your photos, title, and/or journaling. If desired, you can also try punching out various shapes from the different color swatches to make your own paper pieced accents. For example, you could punch out different sizes of flowers from a swatch of purple paint shades and arrange them from largest to smallest with a decorative brad on top. Do you have friends or family members who carefully save the gift wrap from every package they've received? Consider taking a page from their playbook and incorporating your favorite wrapping paper into your next scrapbook layout. This works especially well for children's birthday pages and Christmas scrapbook layouts. If the wrapping paper is too flimsy to support your photos, glue two sheets together or glue the wrapping paper to a cardstock background before you begin. Although the ideas mentioned above work well for creating memorable layouts, it's important to consider that papers not made specifically for scrapbooking are not acid-free and may damage your photos over time. Spraying the paper with a product such as Krylon's Make it Acid-Free! can provide some protection, but it's always best to scrapbook with copies of your photos and keep the originals in a safe location.